The 80th IBM British Ring Convention held in Buxton from 8th – 11th September 2016 was buzzing throughout the four days, even from the informal night before get together. Granted, there was neither stage nor close-up competition this year, but we are living in changing times. Busy life styles and falling numbers of stage venues for performing all possibly contribute to these missing events. The spaces left were turned to advantage with other equally popular goings on, so there was still plenty to see and do. The afternoon opening show by Norvil and Josephine had just the right balance of magic, music, song, dance, acrobatics and melodrama to fit nicely into their allotted slot. Opening show over and we were off. The evening continued with a show from the Northern Magic Circle who celebrated their sixty years of existence as we celebrated our eightieth convention. Steering the ship on this occasion was Brian Lead, with what appeared to be his endless list of puns. The show had many forms of magic on offer including manipulation, mind reading, general patter and even a ‘performing flea’. The Friday traditional convention Gala Dinner was well supported but for others where this is not their scene, Bob and Sue Hamilton presented Nostalgia in the Opera House. Later in the evening both sides united for the Late Gala where the comedy, skills and magic from Paul Ray, Tim Bat, Quentin Reynolds and Keith Fields will be remembered for a long time. Show wise Saturday brought, in the morning The Sooty Show very successfully performing to a large and excited audience, the evening Gala Show brought in acts from not only the UK but also Holland, Germany, Hungary, Spain, USA and Ukraine. This has been considered by many to be one of the best convention highlights of the last few years. Mix all this with some fine lectures, The History of Mystery, Balloon Workshop and opportunity to see the dealers, and you had a finely balanced convention favourably commented on by most. 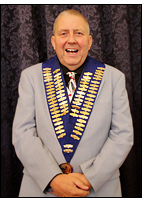 On Sunday afternoon 11th September Clive Moore was installed as President and he with his lady Jean Ellison look forward to officiating over the next convention being held from 7th – 10th September 2017 at The Beacon Centre in Greenock – 25 miles west of Glasgow. It is a very long time since a British Ring held a convention in Scotland so a return there is long overdue. I am sure many of you want to support it. Carol Tynan is the new Registration Officer who may be contacted via www.facebook.com/IBM.BritishRing25 or email ibmbritishring25reg@gmail.com. Brian Miller and Keith Cooper had delivered what they set out to do five years ago, to organise the next five conventions. They are now taking retirement from this, paving the way for Moira Fletcher and her team to take over. Keep in touch with MagicWeek to find out what is being booked for next year.